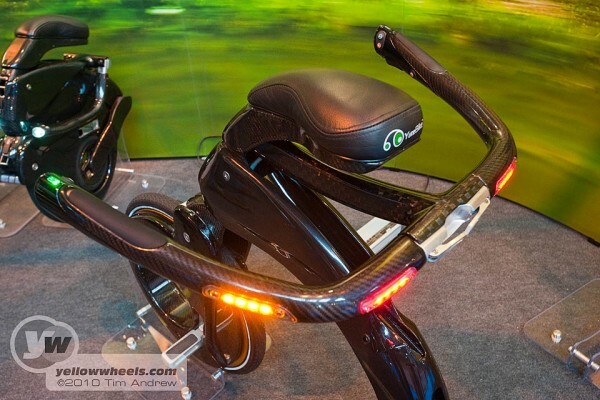 YikeBike electric bike – is this the future of personal mobility? 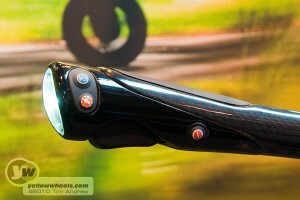 Top gadget or serious last mile commuter electro-cycle? The bulky Segway really put a firecraker in the staid environs of the PMD or Personal Mobile Device. Their electric twin wheeled lean-mobiles are a triumph of lateral thinking made possible by the availability of new battery technology and gyroscopes. Their success spurned inventors to create other revolutionary devices and for the results to be taken seriously by investor and public alike. Electric longboards, trikes and trad-bikes in all shapes have appeared. 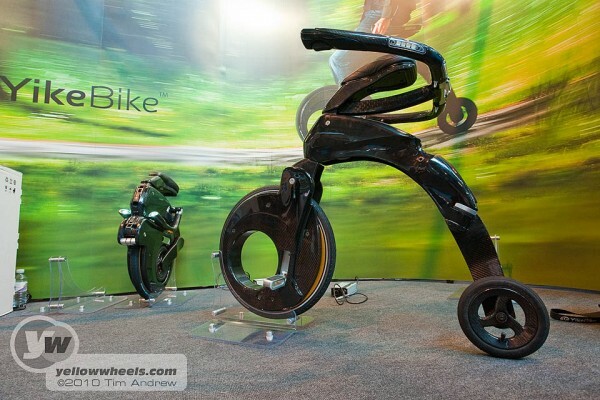 Most striking one of these was on display and available for test drives at the recent Gadget Show Live exhibition: the YikeBike. Kiwi inventor and entrepreneur Grant Ryan and YikeBike co-founder Peter Higgins flew in with their team all the way from Canterbury New Zealand to show their carbon fibre YikeBike to press and public. Unable to resist making a fool of himself our valiant scribbler Timtim queued up for a few tentative laps of the test area. Over to you Timtim. Safety gear donned and disclaimer signed I approached the YikeBike a trifle nervously. I’d just watched a demo of how the “bike” folded from adult sized electro-penny-farthing-for-the-23rd-century to briefcase-sized-carbon-centrifuge with the flick of a few catches and levers. I’d also sampled the minuscule weight. Would 10kgs of carbon and li-po battery form a stable platform from which to navigate the urban roads it’s designed to handle? That’s the weight of a normal bicycle without battery, electric motor, control box, front and backlights, indicators! You sit on the saddle and grab the handle section of a large U shaped carbon tube that goes round the back of the YikeBike. 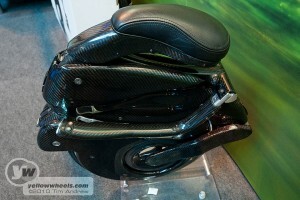 I’d better stop using the adjective carbon: apart from a few bits of alloy it’s all carbon for lightness. It feels strange: there’s nothing in front of you. 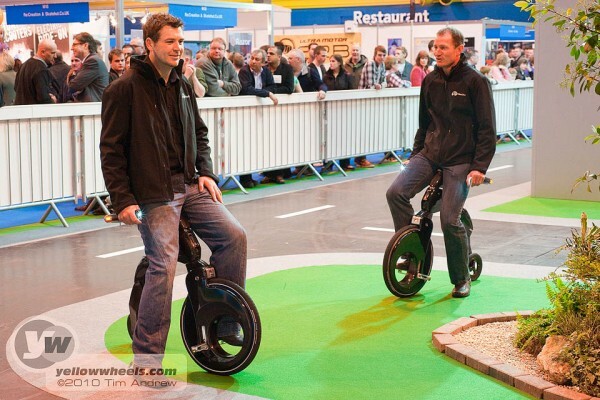 A Segway has a reassuring handlebar to hold onto. Here there’s nothing in front, but my guide is reading my mind and gets me to put one foot on the footrest. This is not a pedal: this not an electrified bike. There are no chain or gears. He tells me to squeeze my knees against the central spine of the bike for stability, gently squeeze the throttle trigger under my right hand, and when underway place my second foot on the other footrest. Easy to say. Not so easy in practice. I feel just like I’ve never ridden a bike. I’m wobbling like a toddler. Give me some stabilisers PLEASE! Peter Higgins tells me it takes a few minutes to reprogram your brain and to persevere. I’d watched others wobbling wildly then handing back the YikeBike and heading for the bar and a few tranquilizing bevvies no doubt ! After a few attempts I squeeze the throttle a bit less timidly and complete a full length of the straight. The extra speed brings equal measures of stability; enough to try my first corner. I steer round successfully and gather further momentum and confidence but my body is rigid, my knees squeezing the bike’s body as if riding a bucking bronco. I relax my knees and wrists on the next lap. The YikeBike now flows. Gyroscopic stability starts to come into play. I’m no longer fighting it and start to lean into the corners. Brake too hard and you can just step forward off the bike as if stepping off an ultra fast escalator: this saved me twice from crashing into the lap of onlookers. Anti lock brakes mean you wont go head over heels if you over do your braking though. 10 laps in and I’m grinning. I’ve got used to the regenerative brakes, mastered the throttle and lost the wobble. But It’s time for the next YikeBike virgin, so I glide into the “pits” and remove all the elbow and knee pads, relieved that they didn’t have to cushion my crash. YikeBikes don’t come cheap. At 2,995 UKPounds they are the toys of rich kids wanting to glide from their Learjet to the yacht; provided that it’s parked within the 10km range claimed by this 25km/h carbon cycle. In conclusion: with a bit of practice it could be a cute little toy to ride from the train station to the office. But the legislation is unclear for such devices: only Belgium, at the time of writing, will legally allow you to take to the road on it. It has no pedals so can’t be classified as an electric bike and riding it on footpaths would be a no-no. Until this is sorted it can be no more than an expensive gizmo, but one with loads of potential and plenty of wow factor.